Glendale, Calif. – Getting into Stepanakert, the capital of Karabakh, very late Sunday after an eight-hour bus ride, my body wanted to lie down, but my heart and mind were pumping with adrenaline. Question after question raced through my brain: Are the parents going to trust me, given that I am from another country? Are the anesthesiologists going to be able to intubate some of the more challenging patients that I have met via the web for the past four months? What kinds of instruments are going to be available to me? This was uncharted territory and I was anxiously awaiting the sunrise. Earlier this year, the Armenian Medical International Committee connected me with Dr. Sasun Vahanyan, the only Oral and Maxillofacial Surgeon in all of Karabagh, which has a population of over 130,000. After looking me up online and watching one of my interviews on Youtube, Dr. Vahanyan invited me to come to Karabagh to perform surgeries together. I arrived at the Children’s hospital in Stepanakert on a Monday morning, excited and apprehensive. I was soon greeted by the smiling 29-year-old Dr. Vahanyan, who I had met only over skype. As I approached the entrance to the Oral and Maxillofacial Surgery clinic, there were about fifty parents and children hovering around the only entrance. They stared at me, their first impressions settling in, while I focused only on trying to get to the door. I apologized about fifteen times before I was able to make it to the white door. The clinic measured about 200 square feet but had everything I needed to get started: a brown desk and one examination chair. I hadn’t had a chance to digest my surroundings when the patients and their parents began flooding in, with or without an appointment. This was nothing like an average day in my usual clinic. By 1 pm we had seen thirty-one patients and promised most of them we would do their surgery. The cases ranged from cleft lip and palate, to trauma patients, to patients with oral tumors to simple wisdom tooth extractions. My years of training kicked in and I was excited to do as much as I could in the short time I had. As we were getting ready to walk out of the clinic for lunch, a scene from a movie unfolded. A helpless mother from a neighboring village came in carrying her 27- month-old daughter who was minimally responsive. The child had a critical neck swelling which was keeping her from breathing normally. After a one-minute evaluation, we immediately took her to the operating room for an incision and drainage of the mass on her neck. Within moments of draining the mass, the child began to breathe easily and was obviously going to make a full recovery. I thought to myself, this was the most rewarding “lunch break” I ever had. Shortly afterward, we headed to the adult hospital. There we saw a 60-year-old patient with a painful swelling on the floor of his mouth which he had been tolerating for the past three months. It looked to me like oral cancer. He, also, was going to need surgery. Over dinner that evening we reviewed all the patients we had seen that day and mapped out our approach for the rest of the week. 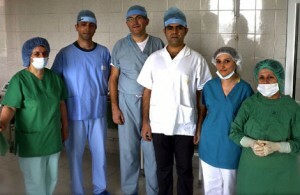 Over the next four days, Dr. Vahanyan and I operated on twenty patients and averaged 12-14 hour days. We performed multiple cleft palate cases, cleft lip cases, removed several oral and neck tumors from adult and pediatric patients, performed cleft lip revisions, removed one set of wisdom teeth and even did a bone graft from the hip to the oral cavity for a patient with a defect in the upper jaw. There was no air conditioning in the hospital and the temperature would reach the low 90s at noon. The nurses had special sterile instruments to dab our foreheads so we wouldn’t contaminate the field with our sweat. The hospital water occasionally ran out and the operating nurses had to rinse our arms and hands with small buckets of water after we scrubbed. I was operating with instruments I thought didn’t exist anymore. Despite all this, things went as smoothly as they do in our pampered operating rooms in the United States. I learned quickly that as long as you have the skill set and will, everything else falls into place. My only regret is that I could not stay longer. On my last day, I was proud of our work, but wished we were able to treat more people. There were close to a dozen patients who still needed surgery – a reason to return in the near future. I hope that the surgeries we performed will make life for our patients a bit easier and I hope some of the skills I passed on to the staff will help them treat patients for years to come. Perhaps most importantly, half way across the globe, I found a good friend and an excellent colleague in Stepanakert. The exchange of knowledge and experience between us taught me lessons that no modern day dental or medical school can teach. The only major disagreement with Dr. Vahanyan that week was the endless debate over the check after every meal.